Andrew Ganz August 2, 2017 Comment Now! 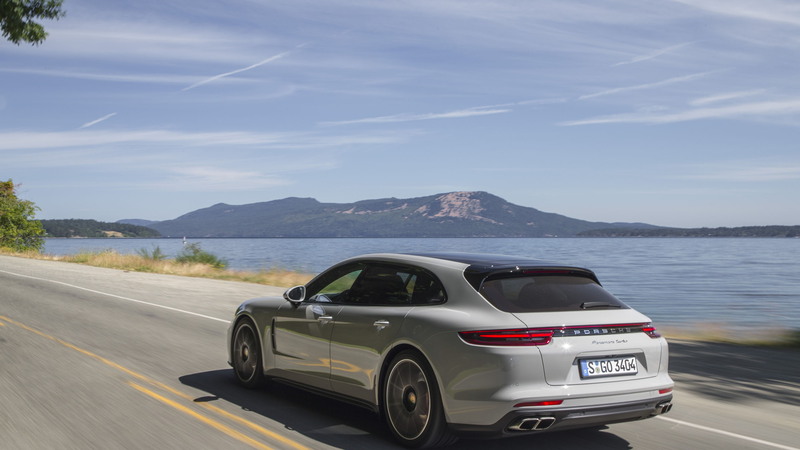 Neither jaw-droppingly gorgeous nor particularly utilitarian, the 2018 Porsche Panamera Sport Turismo is nonetheless highly endearing. It’s the latest in a line of cars from Porsche that seem to do little wrong either on paper or in reality. It's practically perfect, but not all that practical. 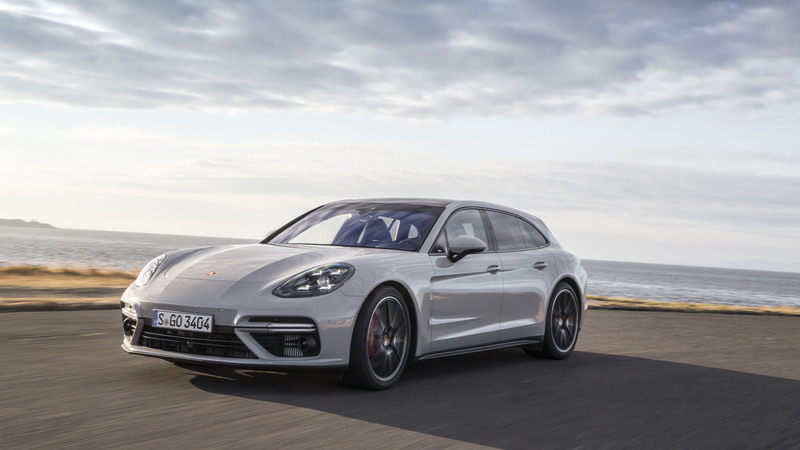 Porsche stops short of calling the Panamera Sport Turismo a shooting brake, but that might be because the traditionalists in Stuttgart realize that it’s a 5-door and not a 3-door. And it's not really a station wagon since it'll only hold about a backpack's worth of additional cargo compared to the regular Panamera. Up until its B-pillars and under its hood, the Sport Turismo mirrors the standard-issue Panamera, but things get more interesting the further back you go. Instead of dropping off aggressively aft of the rear seat in an attempt to channel the 911, the Sport Turismo’s roof line curves gently downward. It meets an integrated spoiler that contains a second spoiler—yes, Porsche put a spoiler in its spoiler—that pops up at higher speeds for more downforce. It’s not a wagon, as a look from the rear clearly indicates. The Sport Turismo’s rear window juts inward rather than staying somewhat vertical. That’s to the detriment of utility but it does endow this 5-door with a truly unique shape. In Europe, it’s the answer to the recently discontinued Mercedes-Benz CLS Shooting Brake. Here, it’s kind of on its own. But that’s something Porsche does well. Porsche doesn’t predict that the Panamera Sport Turismo will eclipse the standard model in terms of sales. To that end, it’s being cautious, at least initially. 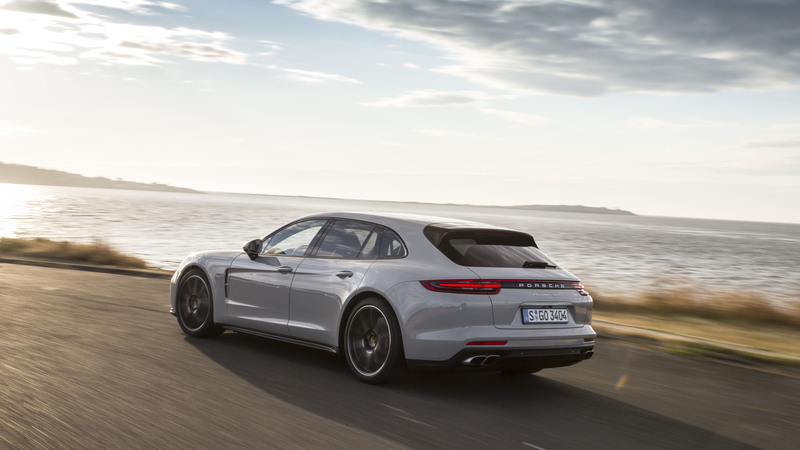 Only all-wheel-drive Panamera 4, 4S, 4 E-Hybrid, and Turbo variants will be on offer. 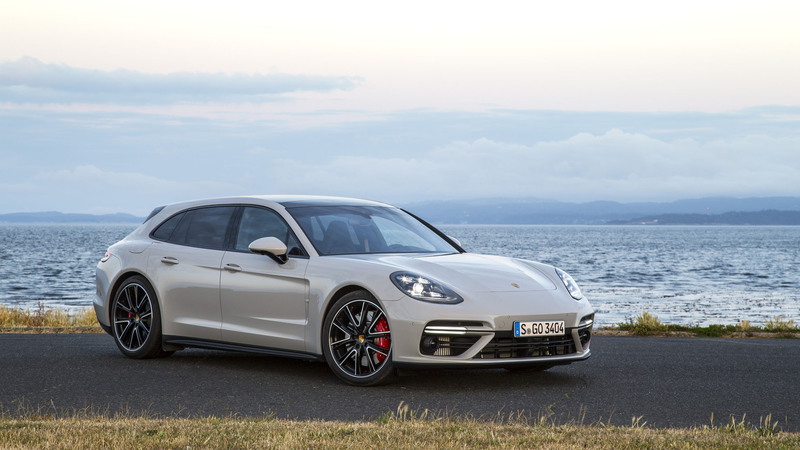 There’s no rear-drive model and the new, range-topping Panamera Turbo S E-Hybrid with its 680-horsepower hybrid powertrain won’t get the Sport Turismo body. Those who do pop for the Sport Turismo, which runs about $6,000 more than the standard sedan shape, will find driving dynamics essentially unchanged by the longer roofline. The Sport Turismo’s roof is a mere 0.2 inches higher than the regular-issue Panamera’s, while its length, wheelbase, and width are unchanged. It does gain some interior room for a total of 49 cubic feet of maximum cargo-carrying capacity. That's an increase of less than two cubes. More importantly, its rear bay is a shaped better for larger objects, making it the better road-trip choice. Porsche bills the Panamera Sport Turismo’s second row as a 4+1 setup, although a full center console is optional and highly recommended. There’s remarkably good room in the outboard seats. Even taller riders should have decent space for their heads and stretch-out leg room once they’re aboard. The aperture for inserting oneself into this plump Porsche remains a bit tight, but not unreasonably so. We sat in the middle seat—if you can call it that. Porsche still fits a console of sorts above the driveshaft hump that robs any semblance of leg space. If you find yourself the very unlucky third passenger, you’ll sit several inches higher than your neighbors and you’ll share footwell space. There may be less usable room in the +1 position than you’ll find in a 911, and that’s really saying something. When we review a Porsche, we rarely bury our driving impressions this far. But in this case, if you’ve driven (or read about driving) a Panamera, you’ve essentially driven (or read about driving) the Sport Turismo. At a recent press event in sunny Victoria, British Columbia, most of my drive time was behind the wheel of a gorgeous Amethyst Metallic Turbo Sport Turismo. Yes, they’re all turbocharged, but this range-topper cranks out a prodigious 550 horsepower from its 4.0-liter twin-turbo V-8. Power is rapidly shuttled to all four wheels through Porsche’s latest dual-clutch automatic transmission; no manual is available, not that anyone would likely buy one. 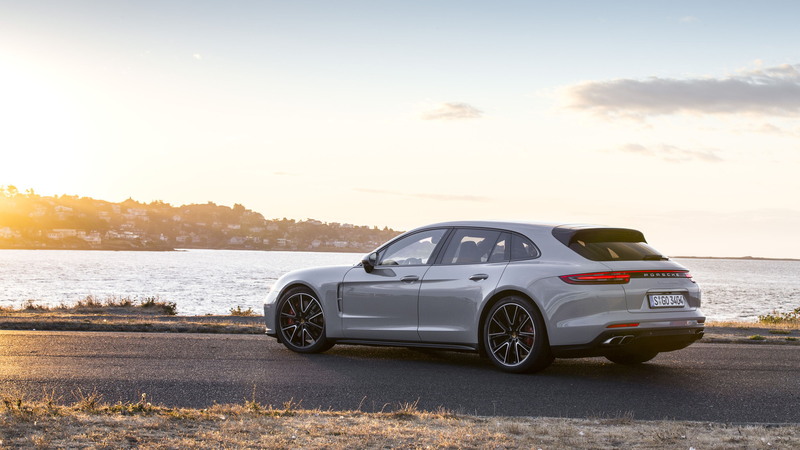 The Panamera Sport Turismo’s suspension is identical to the standard Panny’s, including its $1,620 rear-axle steering system. It’s worth it alone for the way it helps this nearly 200-inch-long luxury car slot into tiny parking spots, but it also aids highway stability and makes the most of a twisty road. I experienced it for myself at rapid speed on a winding, pockmarked logging road. It’s a surreal level of confidence offered by the Panamera’s taut—but not too taut—adaptive suspension. Skip the carbon-ceramic brakes unless you’re going to drive on a racetrack (in which case, maybe just order a 911 GT3 instead?). The standard 6-piston units provide predictable, fade-free stopping without the grabbiness and insanely expensive running costs. The $2,530 Sport Chrono package is certainly worth the coin here. Yes, it comes with the silly analog timer/wart-on-the-dash, but it also includes Normal, Sport, Sport+, and Individual modes accessed via a nifty dial on the steering wheel. More fun is the Sport Response button that spools things up for 20 seconds of immediate passing thrust. It’s gimmicky, but I pressed it at least half a dozen times with increasing giddiness. Like any Porsche, it’s hard to rationalize the Sport Turismo. Even the automaker seems somewhat confused about its purpose in life, stressing that it “brings new variety” to the automotive world, rather than kayak-carrying utility. But that doesn’t stop us from swooning, either behind the wheel or behind the…behind.